Car sharing is a great way for us carless types to have easy access to wheels whenever we need them. 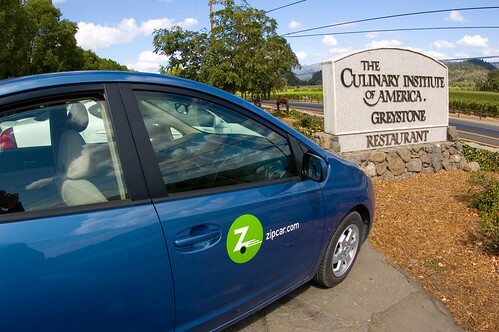 I’ve been a Zipcar member for a little over a year now, and love its ease of use, with online & mobile booking, and availability all over the city. I also get to drive all kinds of cool cars (like Priuses and Mini Coopers)! Members also get to use cars in other cities, like New York, Boston, Washington D.C., Chicago, San Francisco, Vancouver, Toronto and London. It’s about to get a little better! Today, Zipcar and Flexcar have announced their intent to merge (read the press release here). This is great for members of both services, for we now get better insurance and even MORE cars/locations to choose from! Flexcar also adds Los Angeles, San Diego, Atlanta, Pittsburgh and Philadelphia to the cities a member can share cars within. I’m pretty excited about this merger and hope it encourages more people to use car sharing! Above photo is of Prius Paltrow on my recent trip to the Wine Country. As long as you’re posting about car sharing, SF’s original, City CarShare, should get a mention. All three have different pricing models, so any one of them might end up costing you less depending on how you use the cars. City CarShare just announced that they’re raising their rates, and that prompted me to put together a quick spreadsheet that tells me how much my last 6 months of car sharing would have cost with Zipcar and Flexcar. I make 1-3 short intra-city trips each month, and City CarShare came out cheapest for me, even with the new $1/hr increase. I’ve been a member of CityCarShare and Flexcar for going on two years, and love that Flexcar and Zipcar are merging – this just expands the pool of vehicles available to me! CCS is the ONLY non-profit of the three, and for my style of use has proven to be the most cost-effective (I use Flexcar mostly for full-day use when I need it for work, and for reserving cars in Portland when I’m there on business). I am SO HAPPY that I’m not a beleagured car owner in the city anymore, and knowing that car sharing makes sense for me financially as well as philosophically is really phenomenally GREAT! Thanks for spreading the news about the merger! In all fairness, CCS does deserve a fair shake. I will reiterate that it does depend on how you use the cars, and my usage pattern (as well as their locations) pulled me to use Zipcar. There really is something liberating about not being a car owner, and I love driving all these different cars! Non Profit does not necessarily mean better, and besides…. grab a ZipCar BMW for a haul up the Highway 1, and then tell me that CCS can do the same for you? ZipCar: The Poor People’s car.